In this, the second of his `time signature` albums Brubeck appears to set out to capitalise on the popular and artistic success of `Time Out` and wow a wider public than that represented by his then existing fan base , moreover , one normally ambivalent about jazz. Inspired by an abstract piece of modern art Brubeck composed a suite of nine pieces in different time signatures and variants of the blues format. The use of abstract art to grace the cover was intended to underline the modernity of the music and theme was carried forward with subsequent albums in the `time signature` series to distinguish them from other musical projects. 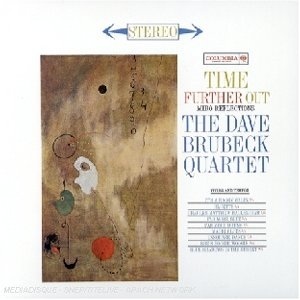 As a devotee of Brubeck’s pre `Time-Out` repertoire I’ve always felt that the success of that album took his music in a direction that lead to the caricature of the quartet’s distinctive style and nowhere was that tendency more apparent than in this particular album. Delightful though the contents are, compared with the quartet’s more weighty fare, they are little more than vignettes, beautiful morsels to whet the appetite leaving a craving for something more substantial. Furthermore , given the implied modernity suggested by the cover art and the title, the individual pieces are actually quite retro with references to ragtime, boogie woogie , even Chopin and a harking back to the success of `Take Five` with `Far More Blue` in the 5/4 meter. There is also another stab at pop chart success with the clap along fun of `Unsquare Dance` in 7/4 and the frothy `It’s A Raggy Waltz`, both destined to become Brubeck `lollipops`. Notwithstanding these observations `Time Further Out` is charming exercise in light jazz , impeccably played by all and offering a pleasing listening experience for even those who would run a million miles in the opposite direction from anything smacking of modernism. Inevitably, as is the case with most re-issues these days, there are bonus tracks; one a reputably long lost rarity, pretty but of no particular distinction, the other a version of `Santa Claus is Coming to Town` recorded at the original session as a warm up piece but thematically redundant as regards the project in hand. Add to this a duo with Charles Mingus and Brubeck, `Non-Sectarian Blues, which originally appeared as part of the soundtrack to a British gangster B movie, `All Night Long`, and was included in a rare Brubeck compilation album, `Summit Sessions` as well as a soundtrack album which became a much sought after vinyl rarity until it was subsequently re-issued on CD. Finally there four tracks taken from a 1961 radio broadcast which include a sprightly version of `Take Five` but in a sub Hi-Fi muffled sound . As expected of Essential Jazz Classics, the booklet is stuffed full of facts, notes and original artwork.